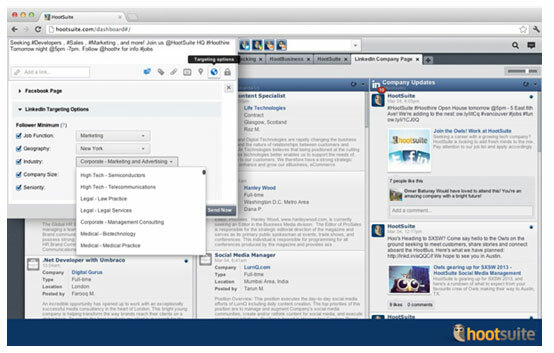 LinkedIn is the world’s largest and most influential professional social network, and in order to help organizations effectively build their presence on this epicenter of networking, HootSuite is excited to release powerful new LinkedIn features in the HootSuite dashboard. Marketers, HR professionals and community managers using LinkedIn Company Pages can now fine-tune messaging with advanced targeting options (for Enterprise clients), and improve the performance of page and status updates with the introduction of new analytic modules (available to Pro and Enterprise clients). Publishers know that the same content isn’t always valuable to their entire global audience; advanced targeting options allow even the biggest LinkedIn Company Pages to reach followers on a more personal level. For example, marketers can publish content targeting high-level enterprise decision makers in specific geographies, while continuing to release fresh Company Page news and messaging relevant to their entire follower base. 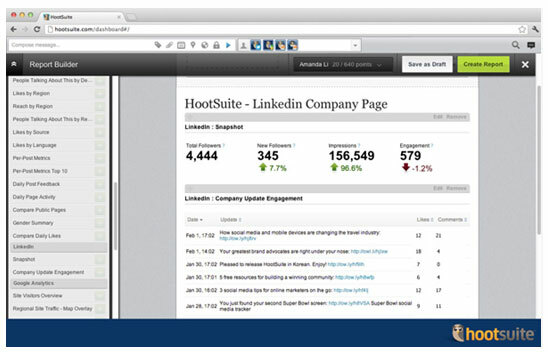 With this powerful new targeting, HootSuite Enterprise users can fine-tune messaging and plug more deeply into the social power of LinkedIn. This entry was posted on Friday, March 8th, 2013 at 6:04 am and is filed under Digital Products, National News, New Releases, Social Media, Software. You can follow any responses to this entry through the RSS 2.0 feed. You can leave a response, or trackback from your own site.